This is a Friday event where players can participate in PVP games of 1v1 until there are only 16 players remaining. 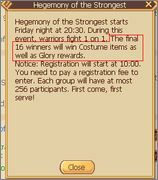 These remaining players will win fashion items as well as glory rewards. Players need to pay a registration fee to participate in this Event.